Enjoy breakfast on the deck and watch the cruise ships arrive or sip cocktails in the glow of a fabulous sun set behind them as they depart! Villa Marbella has many possibilities due to its unique design. The main house boasts a double dutch door entrance opening into the expansive great room containing the kitchen, dining and living room and the sliding glass doors at the other end open to the pool deck and view. The main house also contains the master bedroom with the same glorious view as well as a bonus room. It is currently owner occupied with 4 individual rental suites each with its own deck or it could be a 5 bedroom guest house plus an office OR a 5 bedroom home with a nursery. You decide what is best for you! Lots of different possibilities for income potential! The lot immediately in front of the villa is available for sale which guarantees no one will build in front of you! 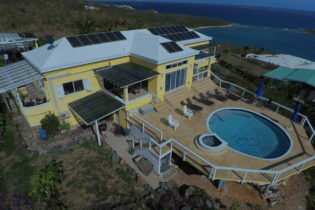 An automatic generator capable of powering the entire property plus a solar hot water heater and ample parking are a few of the extras that are too numerous to list. Sq. footage to be verified.